Back 2 School Blast Needs YOUR Help! Did you know that for the last 15 years Project 29:11 has hosted the annual Back 2 School Blast? You might be asking yourself, What is the Back 2 School Blast? Its an awesome community event taking place on August 7th at Covina Park that distributes backpacks filled with school supplies to families who might not otherwise be able to afford these items for their kids on their own. Not only do these kids get new backpacks filled with school supplies but they also get free dental, vision and medical screenings which are so important for the health of these children. As if that wasn’t enough Taco Bell has partnered with the Back 2 School Blast to offer a light meal to everyone and several of our local beauty colleges are providing free haircuts! There will also be fun for the kids, like free face painting, and their parents/caretakers can speak with agencies that can provide free services to these families. New Century Realtors-Covina has pledged to gather supplies that are going to go in these backpacks. Last year over 900 backpacks were given out to children and we are hoping to make it more this year! Can you help? 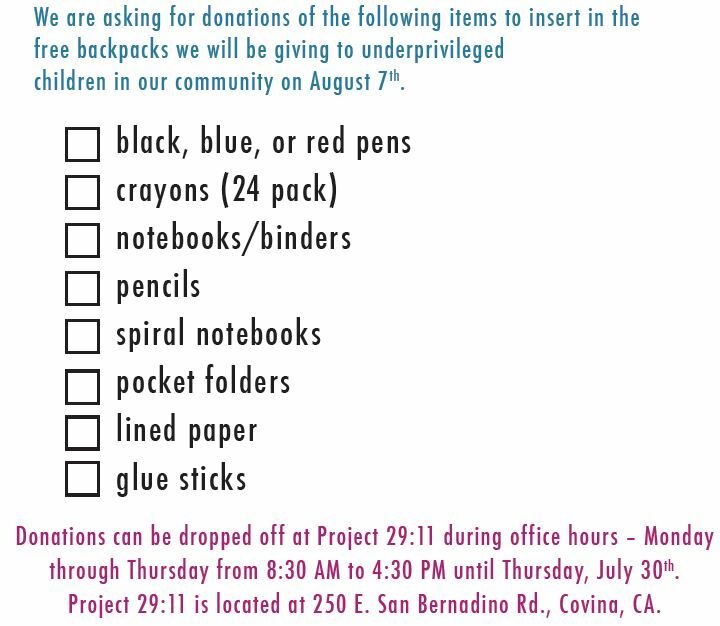 We would so appreciate it if you could take a couple of minutes out of your day to buy a few items and drop them off either at Project 29:11 located at 250 E. San Bernardino Rd, Covina or at New Century Realtors-Covina located at 254 E. Rowland Street in Covina. Every little bit will definitely help give these kids the right start to the coming school year. If you are interested in volunteering at the event or have any questions please contact Sandy Futter at sfutter.p2911@gmail.com or (626)373-2976. This entry was posted in Things to do in Covina and tagged Back 2 School Blast, Back To School, Covina, covina ca, covina park, Covina Residents, Free Backpacks, Free School Supplies, Help!, New Century Realtors, New Century Realtors-Covina, Project 29:11, School Supplies, Yesenia Ruvalcaba, Yesenia Ruvalcaba-Garcia by Yesenia Ruvalcaba-Garcia. Bookmark the permalink. Reblogged this on New Century Broker's Blog.